A “Digital Helix” is saving dying retail giants from collapse… transforming their DNAs… and handing early investors massive profits of 618%… 834%… up to 2,537%. As you know, we are in the middle of a retail apocalypse. Brick and mortar retail chains are closing shop at an astonishing rate. While most retailers are getting crushed… going bankrupt… closing stores…. A small handful of them are hitting record sales and doing better than ever. They are using a “Digital Helix” that, according to the World Economic Forum, could generate $100 TRILLION in value by 2025. Delivering some of the most jaw-dropping success stories of the last decade. Since then their stock has soared 618%. After years of decline, their stock shot up 834% once they started putting the Digital Helix to work. 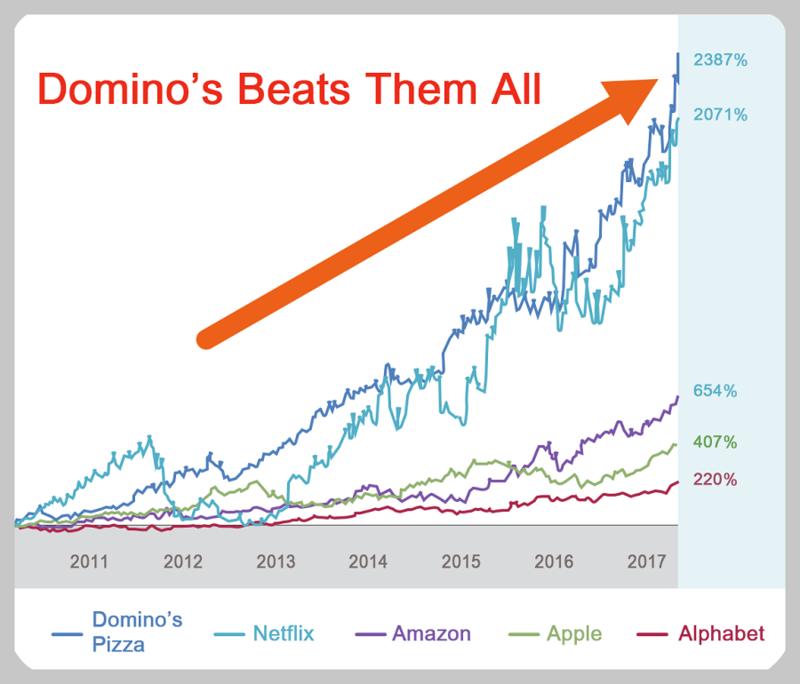 And look at Domino’s Pizza… their stock has skyrocketed over 2,500% since they embraced the Digital Helix in 2010. If you listen to the mainstream media, the retail apocalypse should be annihilating these companies right now. These companies should all be dead right now… at least according to financial analysts and Wall Street. But instead, they have made their shareholders RICH. You would now be sitting on a small fortune of $428,900. Just these three stocks would have turned a $30,000 investment into $428,900. These are simple, safe, “blue chip” stocks that made their investors a fortune. And how YOU can get in on the next company that is putting this Digital Helix to work right now. Enough to turn a $10,000 investment into more than $250,000. I believe this could be the biggest profit opportunity in my 32 years in the financial markets. My name is Tony Daltorio. While MOST traditional retailers are having trouble keeping the lights on. The winners stumbled upon the key to unlock a $100 Trillion Digital Transformation that’s underway to explode their businesses. The ways these high-tech innovations will transform our lives are endless. And so is the profit potential this breakthrough technology will bring to businesses and investors. According to the World Economic Forum, this digital transformation could create $100 TRILLION in value by 2025. That is FIVE TIMES more than the entire GDP of the United States. This digital transformation could create an almost unimaginable amount of wealth…. And I want YOU to claim your piece of this $100 trillion pie today. So, in a moment, I’m going to tell you about a single, safe, “blue chip” stock with the potential for a 2,537% windfall. That is enough to turn a $10,000 stake into $263,700. Enough to change your financial destiny… and set you up for a life free of ever having to worry about money again. Staples has been closing stores left and right over the last years. Barnes & Noble is currently on its last leg. Sears was once one of the biggest department stores… and is now in its death throes. And they all failed horribly at making their investments pay off or turning their businesses around. All the winners I’ve told you about bet big on the “Digital Helix”. My top stock has ‘cracked the code’ and transformed their Digital DNA. Setting you up for massive profits. It transforms an organization’s DNA – and unlocks the potential for massive profit breakthroughs. 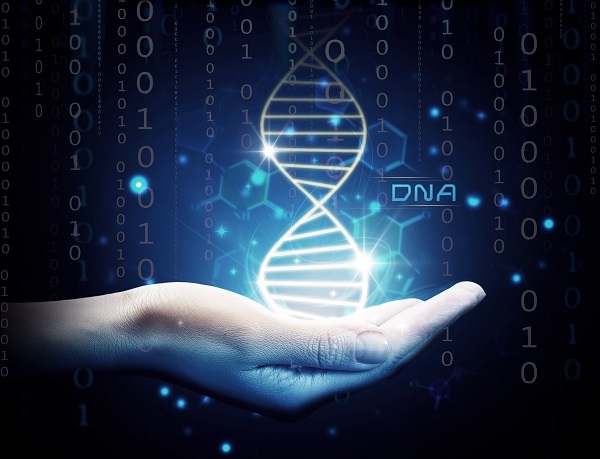 If you look at a DNA molecule, it’s just two interconnected strands. On their own, they don’t look like much. They form the basis for all life in the known universe. And it’s the same with the Digital Helix. But put together in the right way, they unlock huge breakthroughs in sales… profits… and ultimately stock prices. Profit Driver #1: Focus on DIGITAL sales to boost revenues. Profit Driver #2: Give your customer experience a DIGITAL facelift. It’s so powerful that is has saved a few dying retail companies from collapse. Back in 2012 the electronics retailer was in terrible shape. Sales were plummeting, and their stock was in free fall. Shares had gone from an all-time high of $56.66 to a 14-year low of $11.85. A catastrophic drop of almost 80%! Wall Street analysts were predicting Best Buy would completely collapse. 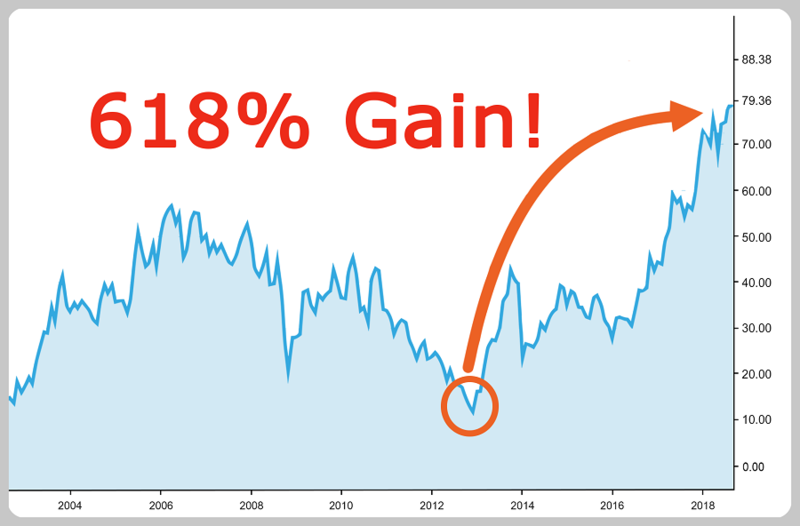 Best Buy Lost 80% and Reached a 14-Year Low! In 2012, Best Buys stock had fallen almost 80% from its all-time-high. But instead, Best Buy used the Digital Helix to revolutionize their business. First, they started working on profit driver #1 – boosting digital sales. Best Buy’s website looked like it had been stuck in a time warp… there were products promoted that weren’t even in stock… and sometimes it could take you 10 clicks to check out an order. Before their “Renew Blue” campaign, only one out of one hundred website visitors bought something. So Best Buy did a complete overhaul of their outdated website. If you look at Bestbuy.com today, it offers a sleek and modern shopping experience that makes it EASY for you to buy. And over 20% in the last two years. In 2018 alone, Best Buy sold over $6 billion worth of products digitally. So, the first profit driver was already a smashing success. Onto the second profit driver of the Digital Helix…using cutting-edge technology to upgrade their customers’ experience. 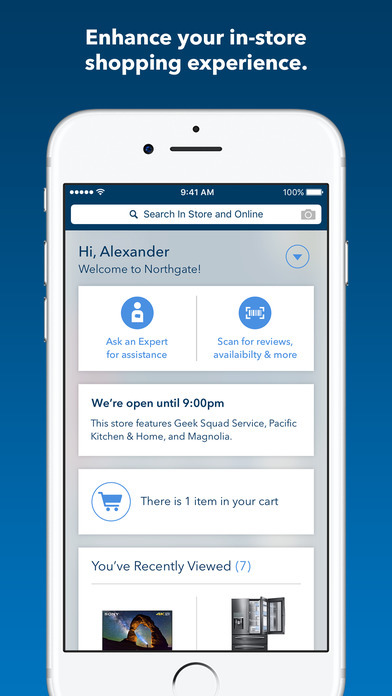 Best Buy launched their “Blue Assist” feature on their mobile app. No more running up and down the aisles to hunt down a sales person to answer your question! Instead, you can now simply push a button on your phone and a sales rep will find YOU. Tech support is only a few taps away with their “Geek squad” app that let’s you schedule an appointment. And to compete with Amazon, Best Buy started rolling out same-day delivery of products right to your doorstep. Which brings us right to the third profit driver of the Digital Helix…using the latest technology to reinvent their supply chain. Before the start of their “Renew Blue” campaign, Best Buy had failed to keep up with Amazon on being able to deliver products quickly and efficiently. Best Buy’s warehouses wouldn’t even fulfill orders on weekends and holidays. Not even to mention that their distribution centers were running on 24-year old software… it might as well have been coded in the stone age! This is now a thing of the past. Best Buy’s new modern fulfillment centers are state of the art. Their distribution centers are now working 24 hours day, 365 days a year to fulfill your order. They can now offer same-day delivery in over 40 markets. You could place an order online on Christmas Eve by noon and have the package delivered by 6 PM. And it sent their stock price through the roof! In December 2012 – when they started implementing the Digital Helix – their stock was at a 14-year low of $11. Since then their stock has soared to a new all-time-high of over $79. That’s a jaw-dropping 618% increase. Had you invested $10,000 back in 2012 before their digital transformation, you would be sitting on $71,800 right now. You could have more than DOUBLED your investment each and every year… for six years in a row! All with a single investment in a safe, stable, “blue chip” stock. Forbes Magazine calls it an “amazing case study” of a successful digital transformation. That could be at least FOUR TIMES more profitable than Best Buy to you. And has made its investors rich. Ten years ago, the retailer was on the cusp of bankruptcy. The US housing market had collapsed… consumer spending was in the gutter… and Amazon was stealing sales from their brick-and-mortar shops. Home Depot’s stock took a beating. Their shares went from $69 to under $21 – a drop of almost 70%! To put things into perspective… the average S&P 500 stock lost “only” 36% in value during the financial crisis in 2008. So, Home Depot was hit almost twice as hard. But what could have been the end of “Big Orange” turned into a jaw-dropping success story. And they bet big on the Digital Helix. In 2008 they started their “Tech 2.0” era and brought on the former eBay CTO Matt Carey. He went right to work on the first profit driver… boosting Home Depot’s digital sales. If you shop online at Home Depot, you now have the option of picking up your products in the store or having them delivered to your home. In other words, Home Depot’s existing stores now serve as fulfillment centers. For the past four years, Home Depot has increased their online sales by $1 BILLION – every single year! 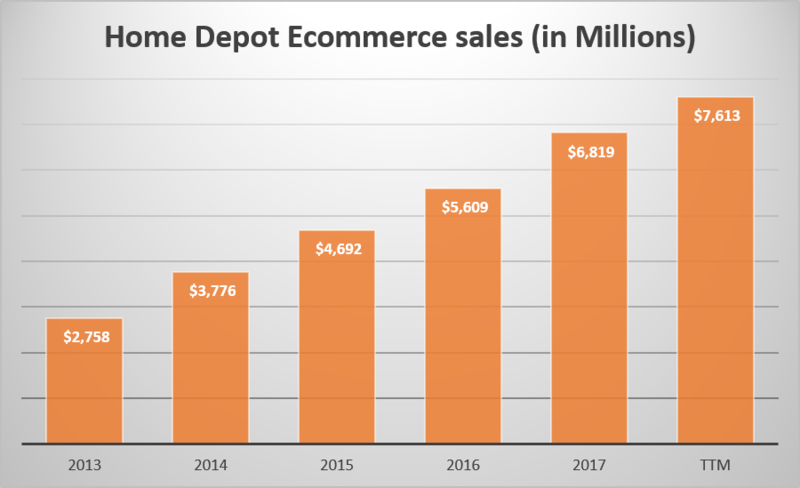 Home Depot is now one of the largest ecommerce operations in the United States! 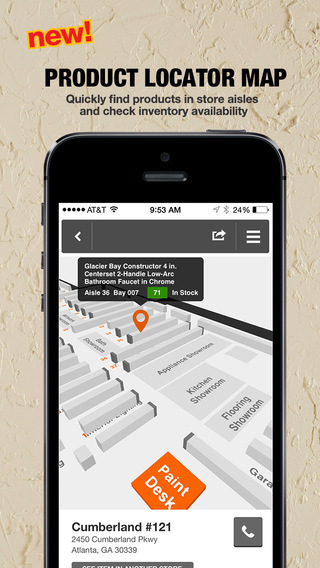 Home Depot immediately moved on to the second profit driver… upgrading their customer experience. One of their first moves was rolling out a smartphone app to help you navigate the notoriously overwhelming Home Depot stores. No more roaming around the aisles, trying to find the product you’re looking for. The app will give you a map off the store that makes it brain-dead simple to find what you need. You can even use it to check if the product you’re looking for is in stock… so that you never waste a trip to the store. But one of their coolest new features is using cutting-edge “Augmented Reality” technology. It shows you what a new counter top would look like in your kitchen… or you can take pictures from your walls and then “virtually” test different colors before you decide on buying paint. After introducing the new app and delivery options, the number of in-store visitors exploded to over 1.5 billion per year… a number of other retailers can only dream of. So, after implementing the first two profit drivers of Digital Helix, Home Depot had already seen their digital sales soar AND boosted the number of visitors to their stores. They tackled the third profit driver of the Digital Helix…improving their supply chain to cut costs, increase efficiency and delivery products faster. Home Depot invested $1.2 billion in a digital upgrade of their supply chain, nicknamed “Project Sync”. Using RFID chips and mobile tracking devices, every warehouse worker now must walk 90 miles less PER WEEK…. That is a HUGE productivity (and profit) increase! Thanks to their massive supply chain investment, Home Depot can now offer same-day delivery in 35 major US metro areas. Not to mention that it saves them a fortune in fulfilment costs. So, Home Depot followed Digital Helix model to a “T”. 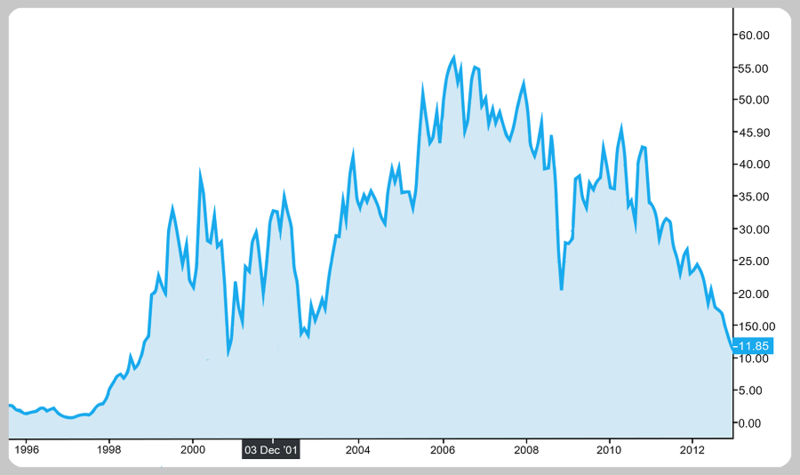 In 2008 the Home Depot’s stock had tanked almost 70% and hit a 5-year low of $21.53. The Digital Helix sent Home Depot’s stock soaring 834%! You would now be sitting on $93,400. That’s an $83,400 profit off a single investment in a safe, blue chip stock! And all this from a company that was “on the brink of collapse”. And if you get in before April 6 you could see profits three times bigger than with Home Depot. Before I give you all the details, I want to show you just one more company that has made its investors a FORTUNE by following the Breakthrough Blueprint. It’s the biggest winner of all—delivering more than a 2,500% gain. I’m talking about Domino’s Pizza. Let’s take a step back into the year 2010. Domino’s Pizza was effectively dying back then. And the stock had tanked from almost $30 to $11 per share, slashing almost two thirds of its value. Domino’s CEO J. Patrick Doyle decided to take drastic measures in order to safe the company from bankruptcy. In 2010 he went all in on the Digital Helix. 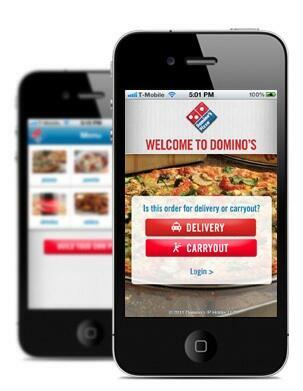 To boost their digital sales, Domino’s was one of the first in its industry to take orders through mobile phones. Over HALF of Domino’s sales are now made digitally, and they sell three times more pizza online than any other restaurant business. It turns out customers spend way more money when they order online than by phone, as they can easily add different items to their order. For the second profit driver, Domino’s launched their digital order platform “AnyWare” that makes it as easy as humanly possible to order a pizza. You can have the virtual assistant “Dom” guide you through the process. You can order via Text Message, Twitter, through your Google Home or Amazon’s Alexa. Domino’s even added 200,000 “hot spots” to their online ordering…so now you can have an oven-fresh pizza delivered to parks and beaches all over the United States. And using GPS-tracking, you always know the exact location of your delivery driver. For the third profit driver of the Digital Helix, the pizza chain invested $120 million into a complete overhaul of its supply chain. The company launched a cloud-based e-commerce platform to quickly and easily deliver pizza materials and store equipment to its 4,700 franchise restaurants. They bought an RFID-based warehouse management system called “StockTrack Plus” that drastically slashed their internal operation costs. And they are even experimenting with delivery drones and self-driving pizza delivery vehicles. Now let’s look how the Digital Helix has affected Domino’ stock price. Thanks to the Digital Helix, Domino’s Pizza has outperformed Netflix, Amazon, Apple and even Google’s parent company! The Digital Helix has turned a PIZZA COMPANY into a more lucrative investment than Amazon! When they started implementing the Digital Helix in 2010 the stock was at $11.30. Since then it has soared/skyrocketed to a new all-time-high of $298.56. An astounding 253% increase PER YEAR! Just imagine more than TRIPLING your money year after year… by putting it in a safe, rock-solid and simple investment like this. Look, I really can’t overstate how important the Digital Helix was for Domino’s Pizza. You would now be sitting pretty on a hefty $253,700 profit. That is over a quarter-million dollars in pure profit from a single investment. Consider this… the average American has $84,821 saved up for retirement. With one small $10,000 investment you could have more than TRIPLED the average American retirement account. And without the dangers that come with volatile penny stocks or other high-risk investments. You wouldn’t expect such massive gains from established retail giants with real store locations, would you? And yet most “experts” today don’t even realize that Domino’s Pizza has outperformed their beloved tech companies. Walmart started using the Digital Helix back in 2011… their stock price has more than doubled since then. Lowe’s stock has shot up 476% since they implemented the Digital Helix in 2011. Walgreen’s stock price has almost tripled they started putting the Digital Helix to work in 2012. Do NOT go out and buy any of these companies I just mentioned. YES, these companies have done very well and there is a good chance their stocks might climb even higher. But the fact is, these companies already have seen massive growth from following the Breakthrough Blueprint. And that is about explode its profits and stock price. …And that is being completely ignored by the financial analysts. Just like they ignored Best Buy, Home Depot and Domino’s Pizza. This company has already finished a lot of the “heavy lifting”—pouring billions into their digital transformation. Their stock hasn’t made any big moves yet. But once it gets going, it will move very, very fast. And this breakout could come soon! My research indicates you want to be on board before April 6 – more about that in a second. …$10,000 in Home Depot back in 2008 when they started their “Tech 2.0 Era”. …And another $10,000 in Domino’s Pizza back in 2010 when they launched their “Pizza Turnaround”. Right now, you would be sitting on a whopping $398,900 in pure profit. You would have made a small fortune off just three simple investments. The good news is that the company I identified could easily dwarf these gains. It could be the most lucrative investment opportunity in my 35 years career as a financial analyst. If you have followed me this far, I’m sure you understand why I’m so excited about this profit opportunity. This ONE Company Could Make You More Money Than Home Depot, Best Buy and Domino’s Pizza Combined! Best Buy, Home Depot and Domino’s Pizza brought their investors absolutely mind-boggling gains… and most “experts” didn’t see these stories coming from a mile away. However, this is nothing compared to what I have in store for you today. This ONE company I have identified it could make you more money than Home Depot, Best Buy and Domino’s Pizza combined. It is currently the FIRST and ONLY company using the Digital helix in a $5.75 TRILLION market. Domino’s Pizza brought its investors a 2,500% windfall by using the Digital Helix in a $45 billion market. But the company I’m sharing with you is operating in a market that is 100 times bigger. They are getting SLAUGHTERED in the retail apocalypse. Meanwhile the company I’m about to share with you is already moving full speed ahead at implementing the Digital Helix. They have successfully leveraged the first profit driver… boosting their digital sales. And this transformation has put them light years ahead of their competitors. They have already rolled out a combined online/offline sales model. Just like Best Buy and Home Depot, you can now order online and pick up your delivery at one of their store locations or have it delivered right to your home. And the numbers are fantastic. In 2017, their digital sales soared 90%. And in 2018 they have already boosted their digital sales by another 66%. Right now, they’re busy working on the second profit driver of the Digital Helix… upgrading their customer experience. They’re rolling out an infrared-sensor monitoring system in their store locations that automatically sends staff to checkouts as necessary. This way you never have to endure long lines at the cash register. They are also testing a hi-tech shelf display technology that, according to Business Insider, could “change this industry as we know it”. This cutting-edge shelf display technology allows them to instantly change prices, activate promotions and automatically undercut competitors sales. It will even talk to your smartphone, guide you to the products you’re looking for and show you the best deals. And then guides you to related products that might be interesting to you, just like the online shopping experience. This new breakthrough shelf display technology is already live in 200 stores… and they’re rapidly rolling it out in their other store locations. But the real crown jewel of their tech expansion comes in the third profit driver of the Digital Helix model. The upgrade of their supply chain. Remember that automated warehouses were a key piece in all the success stories I showed you so far. They radically slash logistics cost and speed up delivery times. We are talking about stocking robots, machine learning technology… the whole enchilada. According to the Financial Times this new technology could become the “killer app of the logistics industry”. Think about it… you order a product online and have it delivered to your doorstep one hour later. That’s something even Amazon can’t offer you right now. This company is following the Digital Helix model to a “T”. It’s making all the right moves to bring its investors breakout profits. In this $5.75 Trillion market, currently only 2% of transactions are done online. And, again, this company is absolutely CRUSHING it in terms of online sales already. Morgan Stanley rates it “the best positioned retail company for online sales” in this industry. So, it’s in the perfect position to take full advantage of this explosive online sales growth. What kind of profits can you expect from such a play? Domino’s Pizza’s stock soared over 2,500%… from bringing the Digital Helix to a $45 billion market. It’s on track to grow its online sales alone to $50 billion over the next five years! 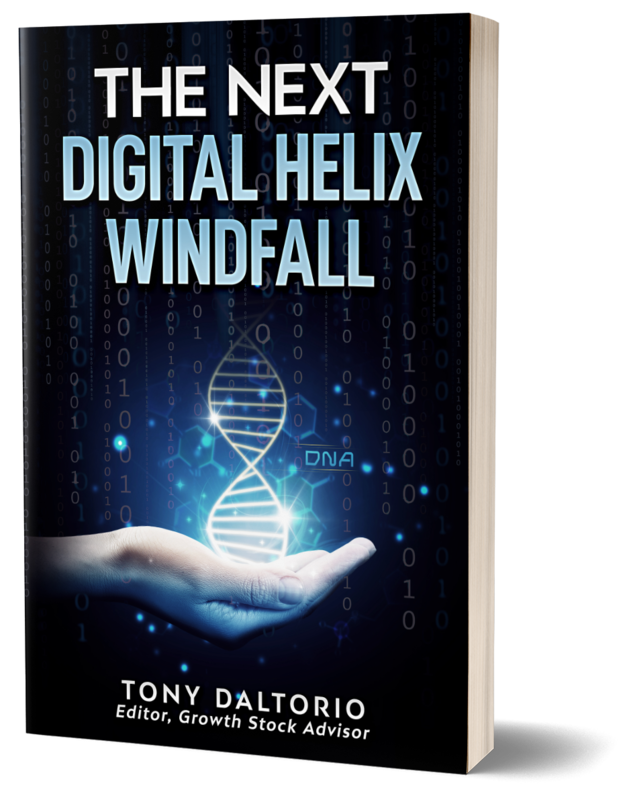 The Next Digital Helix Windfall Could Hand You A 2,537% Gain… Enough to Turn a $10,000 Investment into $263,700. Now look, of course nothing is ever a sure thing. You are looking at a potential 2,537% gain – enough to turn $10,000 into over a quarter-million dollars. And it could be even higher. But the company has already set their sights on new markets. An explosive $750 billion growth market that, according to Euromonitor, will grow “more than any other market on earth”. In the long run this company could easily DOUBLE or TRIPLE the gains we saw with Domino’s Pizza. They are brilliantly leveraging all three profit drivers of the Digital Helix. That’s one reason the stock wasn’t touched during October’s market pullback. It was solid as a rock. In fact, it’s up almost 20% since its low in October. And now I’m expecting this stock to make its move very, very soon… by April 6th in fact. That’s when management will release their new earnings reports. My research indicates that the Digital Helix will already show a HUGE effect on their bottom line once they reveal the new numbers. You want to be on board BEFORE that happens. So, you must move FAST… and get in before April 6! Even if this firm is only HALF as successful as I expect it to be… folks who follow me will stand to make a fortune. That’s why I’ve prepared a special report called “The Next Digital Helix Windfall” that has all the important information you need about this explosive growth stock. This report contains the stock ticker, my in-depth analysis and the entry price you want to buy at. Everything you need to get in right now… and set yourself up for massive profits. 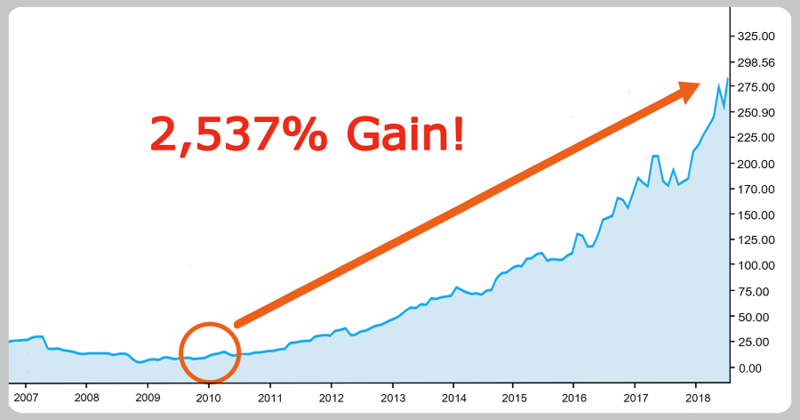 Again, my estimate is a 2,537% gain… enough to triple the average American retirement account with a single investment! In the long run, including the Chinese market, this number could easily double or triple. The Next Digital Helix Windfall report has a $49 value. And frankly, that’s a steal considering the profits I expect you to make from this company. However, in a moment I will tell you how you can get it for FREE. And there is another way to play this and see huge profits that I want to tell you about. And they will benefit from it without using it… or without even knowing that it exists! These three companies are providing the “backbone” for this $100 trillion digital transformation that’s unfolding right now. They sell the technology that every company needs if they want to benefit from the Breakthrough Blueprint. These three picks are almost guaranteed to become big winners in the new digital transformation underway. Winner #1 provides one of the key technologies for the Digital Helix – automation. You know by now what a crucial role automation technology plays in the Breakthrough Blueprint. All the success stories I told you rely heavily on warehouse automation technology. And this automation specialist provides the software, controls, consulting services and equipment they need. Every time a company wants to follow the Breakthrough Blueprint, they must buy from this tech-expert. And here’s the real beauty: This automation specialist isn’t only selling to retail companies. It’s also selling to industries like energy, mining, paper, chemicals, semiconductors and much, much more. Winner #2 is a powerhouse in the semiconductor industry… providing a crucial backbone of the Digital Helix. Robotics, AI, IoT, automation, smart warehouses… none of these technologies can operate without microchips and semiconductors. I have found a behemoth of this industry that is still overlooked by Wall Street. It has a whopping 56% market share and is one of the biggest suppliers for Apple’s chip production. Even better, its biggest rival just put its chip-production “on hold indefinitely” (they couldn’t swing the production costs) … making this semiconductor specialist the biggest player in its industry. You won’t find a better way to profit off the microchips that are powering the $100 trillion digital transformation than this company! Winner #3 covers Robotics & Artificial Intelligence… another must-have “ingredient” for the Digital Helix. The success stories I’ve shown you are already taking advantage of AI and robotics technology. And this massive tech-trend is just getting started. According to a study from Research and Markets, the industrial robot industry will grow by more than 40% PER YEAR over the next five years as this technology becomes cheaper for companies to buy. My pick exposes you to a global portfolio of industry leaders in the United States and Japan – the perfect way to benefit from this explosive growth sector. 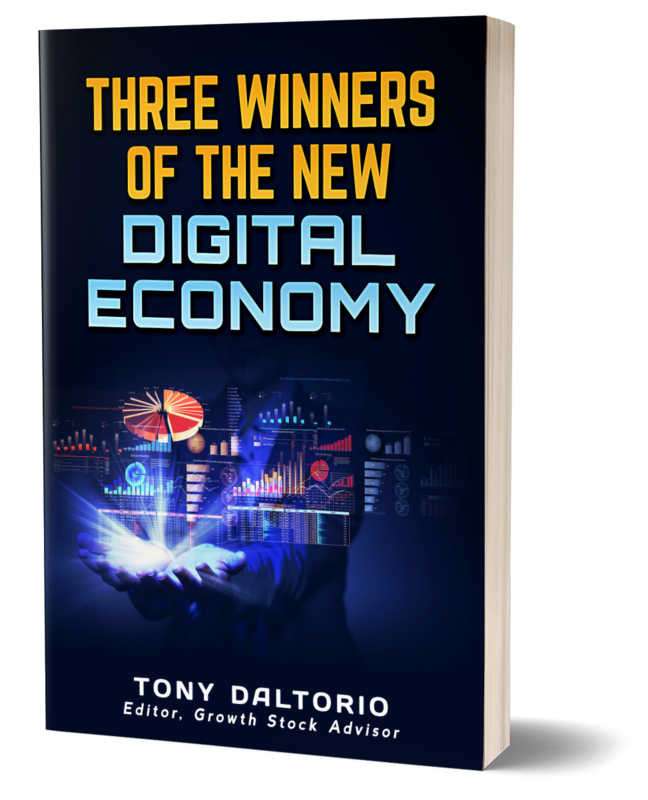 You’ll get the details on all three of these “picks and shovels” stocks in your copy of Three Winners of the New Digital Economy. I consider this special report the perfect addition to the Next Digital Helix Windfall. Plus, you can cash in on the top-companies supplying the infrastructure and technology. Usually this report —Three Winners of the New Digital Economy –is valued at $49. I invite you to try out my flagship investment service Growth Stock Advisor 100% risk-free. Say yes, and I will instantly provide you with a link where you can claim your digital copies of The Next Digital Helix Windfall and Three Winners of the New Digital Economy. There is a simple reason for it. During my time at Charles Schwab, I helped a lot of wealthy people make even more money. Because, at the risk of sounding cocky, I am very good at what I do. But over time, I’ve come to loathe the financial industry. I’ve seen too many financial advisors push terrible investments on their clients, just to collect a fat commission check. My breaking point came during the crash of 1979. I had to personally had talk down a customer on the phone who got wiped out from several garbage investments he was bullied into. So, I can focus on bringing the most lucrative investment opportunities to YOU… free from any hidden agendas. Which is why I will give you these valuable reports for FREE if you try out a 100% risk-free subscription to my flagship investment service Growth Stock Advisor. My goal for Growth Stock Advisor is simple. Companies that are bound to dominate entire industries… and bring you a virtually unlimited profit potential. 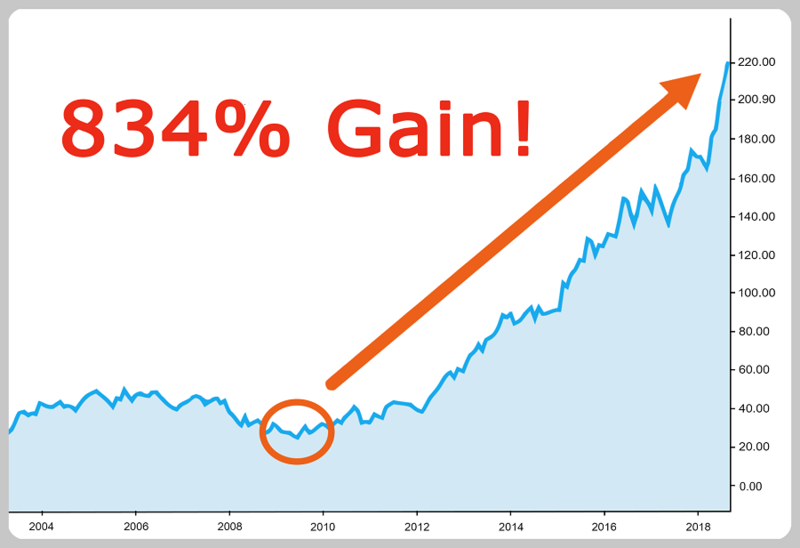 Stocks that deliver big gains from massive trends…gains like 618%, 834%, and 2,537% that the Digital Helix made possible for “dying” retail companies. But personally, I’m looking for MORE. And if you are too, you’re in the right place. A single investment could more than TRIPLE the average American retirement account for you. However, you must make your move before April 6… that’s when they report their new earnings number and this stock could start moving. 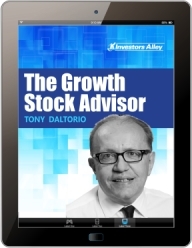 As a member of Growth Stock Advisor, you will receive Monthly Editions delivered right into your email inbox. These Monthly Editions are jam-packed with in-depth market analysis, intel about the newest economic trends, my stock recommendations and updates on our portfolio holdings. Since our stocks are constantly on the move, I’ll send you Mid-Month Updates in the middle of each month. Here you’ll find insights on the newest economic megatrends and where the new profit opportunities are forming worldwide (because some of the best gains are found outside of America – and I like to go where the money is!). You’ll receive my Portfolio Reviews – an up-to-date analysis on the Growth Stock Advisor portfolio. Complete with clear, simple-to-follow “Buy up to” instructions to guarantee that you NEVER pay out of the nose for one of my recommendations. I’ll send you E-Alerts with clear buy and sell instructions when a hot opportunity just can’t wait until the next monthly issue. This way you’re guaranteed to never miss out on a big profit opportunity. PLUS, you’ll have Direct Access to Me. I want to make sure that this is a two-way conversation. And that’s why, from the moment you join my investment service, you’ll have full access to my personal Email. You are free to reach out to me with questions concerning any of the topics we discuss in Growth Stock Advisor. And finally, you’ll have 24/7 Access to Our Exclusive Members-Only Website. Here you can browse the entire Growth Stock Advisor archive, read all Special Reports and of course look up the current Portfolio. I’ll be there beside you, guiding you every step along the way. But before we get you all set up, I have ONE MORE GIFT for you. If you decide to join me for a 100% risk-free trial membership today, I will send you another report – completely FREE of charge. So far, we talked a lot about the $100 trillion digital transformation… and the amazing profit opportunities the Breakthrough Blueprint can deliver to you. However, not every company in this field will be a winner. As a matter of fact, a lot of them are outright LOSERS that drain your account and kill your profits. 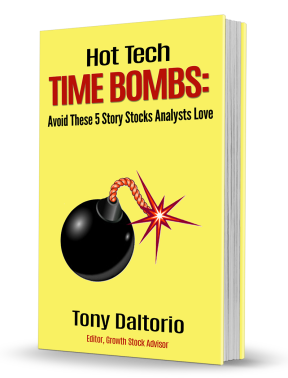 If you follow mainstream analysts and their stock recommendations, there is a good chance you have at least one of these time bombs in your portfolio. It’s bleeding customers and reeling from several legislation and PR-disasters. Worst of all, analysts are still in love with it! The last thing you want is to have one of these losers sink your portfolio, while missing out on the 2,537% Digital Helix windfall. So, you will find it all in my bonus report – a $37 value – and it’s yours FREE if you give Growth Stock Advisor a risk-free trial today. The total value of The Next Digital Helix Windfall, Three Winners of The New Digital Economy and Hot Tech Time Bombs is usually $167. Heck, the information in these reports could be worth tens… if not hundreds of thousands of dollars to you. However, if you accept my invitation today… you pay absolutely NOTHING for these valuable reports. All you must do is join me for a trial-membership of Growth Stock Advisor. Usually the membership-fee for a one-year subscription is $149. And the 2,537% profit opportunity I want to bring to YOU. You Get A $100 Discount – All This for Only $49! If you reply today, your trial membership with Growth Stock Advisor is only $49 – a whopping $100 discount. The fact is, I can only help you make money if you try my work first – to see if it’s right for you. That’s why I want to make this a “no brainer” deal for you. I’ll even take on all the risk and give you a 60 day, no-questions-asked money back guarantee. If you’re not 100% happy with Growth Stock Advisor, you get ALL of your money back. Just contact my customer support team via Email or Telephone within the first 60 days of your trial subscription and they will refund you every single cent. Start Your Trial Subscription Now! Look, I know I’ve thrown a lot at you today. The Digital Helix has already saved dying retail giants from collapse… and created windfall profits of 618%, 834%, over 2,500% for early investors. Not even to mention my Three Winners of the Digital Economy that will profit handsomely from this $100 trillion digital transformation… and the 5 Hot Tech Time Bombs you need to avoid like the plague. This is YOUR chance to triple the average American retirement account with a single investment. Your chance to quietly make a move before the mainstream media gets wind of this massive opportunity. No leverage, no options, no risky bets. A single “blue chip” investment could hand you a fortune. If you are ready to take your investment career – and your wealth – to a whole new level, my Growth Stock Advisor is the quickest and easiest way to get there. All you have to do is click the button below. But please keep in mind that the clock is ticking. If you’re still on the fence, I have ONE MORE GIFT for you. Click the button below to start your risk-free trial.